I went (literally) EVERYWHERE with this pack - and in this post shared EVERYTHING I liked & didn't with photos! When compared to other backpacks, Osprey Farpoint 40 | from $125.00 (women's specific counterpart is Osprey Fairview 40 | from $133.09) tested as the best travel backpack and the best carry-on backpack mainly because of its unbeatable comfort and versatility. Its size at 40L is optimal for most conditions, at 22 x 14 x 9 inches it's carry on compliant for most airlines and it can be used for weekend hiking & camping activities as long as it doesn't exceed 3 days (because the ventilation and size suffers) and even for daily purposes (especially if you travel with a laptop, side carry handle is SUPER useful)! Because of Osprey's All Mighty Guarantee you can stop worrying about the pack and enjoy your time. It's also pretty stylish and pretty - at least to me and my friends. The only downside is that ventilation & comfort comes insufficient for longer than 3 days of hiking trips. Also, having the laptop in a back panel compartment instead of in the middle one would have made this pack even more comfortable due to better weight distribution - but you probably won't notice any discomfort because every other thing about comfort is on point. ​Bottom line, Osprey's Farpoint 40 is a very comfortable and versatile carry-on size travel backpack with a lean towards outdoor activities. Laptop sleeve: 14 x 11 x 1.5 inches. Meaning that laptops up to 15.6" can fit perfectly. For 17" laptop, sleeve height doesn't suffice but laptop still stays inside the pack. Tablet sleeve: 10.5 x 10.5 x 1 inches. Meaning that tablets up to 10" can fit. Fits torso lengths between: 15" - 19"
Fits torso lengths between: 18" - 22"
See women's counterpart Osprey Fairview 40 | from $133.09. Turn your smartphone sideways for best display. Very comfortable because of its (1) adjustable harness, (2) entire back panel, shoulder straps, carry handles and hip belt are thick and generously covered with pleasant padding, and (3) two size options to correspond the torso height for further customized fit. The reason for the popularity of Osprey's Farpoint 40 is its exceptional comfort. The entire back panel, shoulder straps and hip belt are so generously padded and the thicknesses and curves accommodate so well to the anatomy of shoulders, chest and neck; it surprisingly feels as comfortable as professional cutting-edge technology hiking backpacks. Load lifter is adjustable to provide seamless fit and offers a built in whistle. Pleasant Atilon foam covered with mesh throughout the entire back panel creates comfortable contact with the pack and transfers the load from core to the peripheral frame. The lid you see (on left) between the hip belts is used for stow away and easily tucked under the pack (not tucked in this photo). 3.5 mm LightWire peripheral frame conveys the load from harness to hip belt extremely well. As the study Epstein et al conducted in 2017 concluded, this helps you walk longer distances comfortably. Our only gripe about comfort should have been that laptop and tablet sleeves come in the front compartment instead of inside the back panel. Because usually, as such heavy items are placed away from your body, they create more moment on your torso and expected to pull your shoulders down. Luckily you don't feel any noticeable comfort deficiency in Farpoint 40 as it exceeds comfort expectations in all other aspects. What's more, this way your electronics (1) are less exposed to bending forces while wearing the pack and (2) don't carry any weight when the pack is laid on the floor for suitcase opening (see organization section) to gain easy access to all your items. Click on image to enlarge and find Farpoint at the bottom. So for instance, it's highly likely that males 6' and above would fit M/L size better and males 5'7" and below would fit S/M size better. Those between 5'7" and 6' would do equally well with both sizes. Still, you'd be safer going for M/L size if you're closer to 6' and vice versa. Unlike other travel backpacks with many pockets, traveler organizers and detachable daypacks; Farpoint 40 is NOT equipped with such features. On the other hand, besides these extra features, we found the main organizational functions such as zippers, compartments, sleeves and pockets to be superior than other travel backpacks, and hence the high 8/10 organization score. Main compartment zippers reach all the way to the bottom. It allows opening like a suitcase and easy access to the entire compartment when the pack is laid on the floor (at left). How to pack Osprey Farpoint 40? Pack it the right way for best experience. Front compartment offers a 14(H) x 11(W) x 1.5(D) inches (36(H) x 28(W) x 3.755(D) cm) of well padded velcro laptop sleeve and a 10.5(H) x 10.5(W) x 1(D) inches (27(H) x 27(W) x 2(D) cm) of well padded zippered tablet sleeve - meaning that up to a 15.6" laptop and a 10" tablet can fit perfectly. If you have one, pack it before anything else to prevent bloated main compartment from compressing laptop sleeve. Additionally, there's a slash pocket and two mesh water bottle holders at the front. Roomy stretch (scratch-free) slash pocket is perfect for (1) valuable fragile items such as jewelry and watches and (2) frequently used items. Internal AND external upper and lower front compression straps (4 at total) (1) secure your items and (2) shrink the pack into smaller sizes to increase stability when not fully loaded. Additionally, utilizing compression straps for external gear attachment saves a lot of energy and time especially in the airport. There are two tool attachment loops on each side at the top of the pack (4 loops at total) which are perfect for attaching shoes externally as Hawbaker explained in 2015 when extra room inside is needed. Dual tool attachment loops are available on each side (4 loops at total). 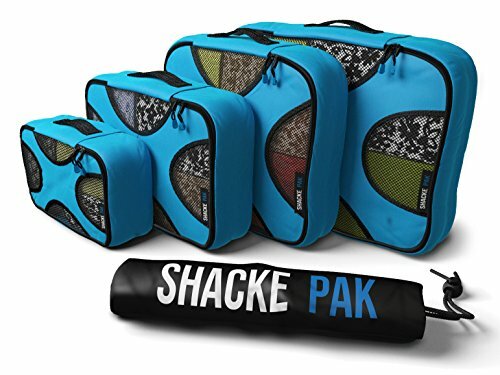 When it comes to packing more with grouping and squeezing your items with packing cubes, you really can't go wrong with the ​Shacke Pak Set | from $24.99​. Shacke Pak Set comes with 4 different size packing cubes (each has 4" depth) and a laundry bag to separate your dirty items while traveling. 4 cubes all together won't fit inside Farpoint 40, although you can pack any 3 cubes together. Foldable and lightweight cubes are equipped with handles that allow carrying like suitcases. It's very useful if you're using a shared bathroom or bedroom (hostels, airbnb etc.). YKK zippers provide excellent quality, durability and smooth pulls. Hidden stitching beneath the zipper adds to the aesthetic look and smooth surface. We think the best packing cubes for Osprey Farpoint 40 is Shacke Pak Set. Also some color options match surprisingly well with our Farpoint 40. Stow away shoulder straps and hip belt, removable duffel bag strap and top & side carry handles allow (1) backpack, (2) duffel bag and (3) suitcase uses during traveling, daily and outdoors purposes. At 22H X 14W X 9D IN, it stays within the carry on size limits of most airlines. One of the biggest advantages of Farpoint 40 is its carry-on compatibility. At 22H X 14W X 9D IN, it stays within the carry on size limits of most airlines. The pack isn't made of steel though, so it's highly likely that it'll be accepted as carry on as most of the other airlines only require around half inches smaller dimensions. Although KLM requires 21.5H X 13.5W X 10D IN, Farpoint 40 fits in the checker without a hitch. Fits into the overhead bin very easily. Although its design intention is traveling, we tried Farpoint 40 while hiking/camping as well and it performed well since you can walk very long distances with it comfortably. The only time it comes deficient is extended (3+ days) of outdoor activities because of its insufficient ventilation and volume. Another huge advantage is that when shoulder straps and hip belt is stowed away, it can be used as a suitcase using carry handles or as a duffel bag using removable duffel bag strap. Carry handles shown in red boxes are thick, sturdy, very well padded and the inner contact surface is covered with mesh (at right). We found side carry handle very useful especially during daily use. Osprey Farpoint 40 isn't waterproof - it's water resistant. It resists rain up to a level, but the longer you stay the wetter your equipment will get. Farpoint 40 doesn't come with an attached rain cover, so we highly recommend investing in Osprey's very own Ultralight Raincover (see below). Medium Size Raincover is designed for Osprey packs between 30L - 50L, and fits perfectly over Farpoint/Fariview 40 (both S/M and M/L sizes). Buy it for life: Even though the zippers, buckles, suspension system and 210D Nylon & 600D Packcloth material of Farpoint 40 stay just as new after years of use; it's still a relief to know that Osprey's All Mighty Guarantee has got your back just in case of any issues for any reason. Kelty Redwing 44 | from $141.93 is a trail backpack with a lean towards traveling, whereas Farpoint 40 is a travel backpack with a lean towards outdoor activities. First thing you need to know is, at 25 x 15 x 12 in, Kelty Redwing 44 is not technically carry-on size. At 22 x 14 x 9 in, Osprey Farpoint 40 is the largest a carry-on size backpack can get. External tool attachment capability of Kelty Redwing 44 (sleeping pad straps, side compression straps) is slightly superior than Farpoint 40, making it more appropriate for traveling on foot than airport travel. Its hip belt pockets which aren't available in Farpoint 40 makes a good use in trail. Another important thing is that laptop sleeve of Kelty Redwing 44 is placed in the main compartment and somehow doesn't feel as stable. From our standpoint, Osprey Farpoint 40 is undoubtedly the winner in terms of traveling. However, Kelty Redwing 44 is a better choice for those who are specifically focusing on taking a flight to hit the trail without the need to having their pack as a carry on. Osprey Ozone 46L refers to a wheeled luggage AND a travel pack. We're not going to compare them in detail but give an idea to grasp their design intentions. You can see more in the product manual if you're interested. 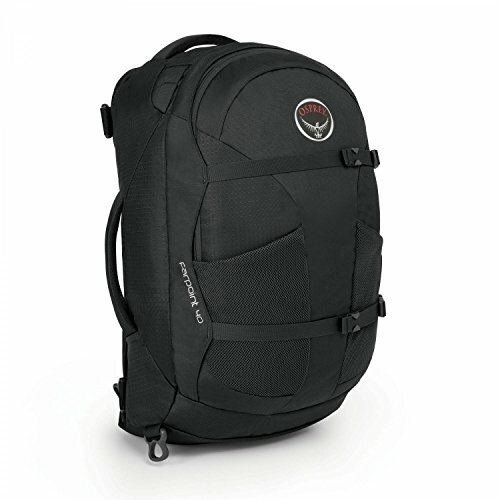 Osprey Ozone Travel Pack 46 | from $160.00 is 20 x 13 x 12 in, so it's not technically carry-on size. Unlike Farpoint 40, stow away harness isn't zipped with a lid, but tucked in pockets nearby. A side carry handle isn't available so daily use is more difficult even with hidden harness. In backpack mode it feels less comfortable than Farpoint 40, but it wins in terms of organization as it comes with a traveler organizer and a bottom compartment. In the end, Farpoint 40 is a better pack unless you desperately need the extra 6L of volume. Osprey Ozone 22"/46 Wheeled Luggage | from $910.00, on the other hand, is 22 x 14 x 9 in, and carry on size for most airlines. Unlike Ozone Convertible Series, there aren't any straps, so it can't be converted into a backpack, but it comes with a detachable daypack. It doesn't make sense to compare a backpack to a wheeled luggage, so all you have to take from this comparison is that Osprey Farpoint 40 | from $125.00 is an excellent backpack while Osprey Ozone Wheeled Luggage is a very versatile wheeled luggage. At 24-25 x 13 x 12 inches, Osprey Farpoint 55 | from $150.00 is not technically carry-on size for most airlines. Sure, most of the time, these things are down to individual staff, so it's possible. What I'm saying is that it isn't guaranteed. If checking your pack gives you nightmares, forget about Farpoint 55 and get a Farpoint 40. Laptop sleeve of Osprey Farpoint 40 (fits laptops up to 17") is larger than Farpoint 55 and 70 (fits laptops up to 15.6")! Farpoint 55 comes with a zip-off daypack that provides an external zippered top stash pocket and an internal tablet sleeve that's super handy during daily use. In the end, Farpoint 40 is a more simple pack than Farpoint 55 and we recommend it everyone looking for a travel backpack. If you're looking for a more versatile, larger backpack that you can use on the trail as well and wouldn't mind checking it while traveling, we recommend Osprey Farpoint 55. 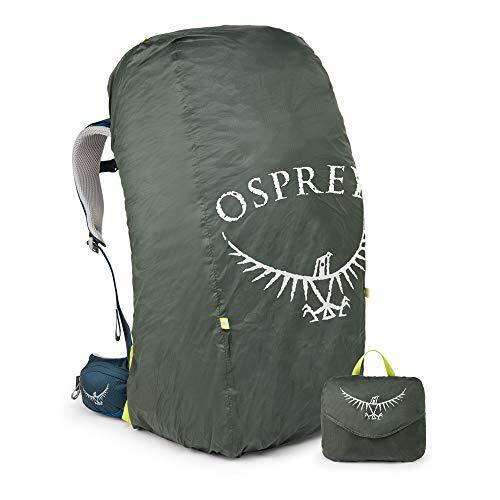 Although smaller, at 19.5H X 13W X 10D inches according to manual, Osprey Porter 30 | $117.60 is not technically carry on size, but that's not our biggest problem with it. You see, Osprey Porter Series, especially Osprey Porter 46, are excellent suitcases with straps. Their biggest downside is the comfort they can't provide. Sure, it still feels comfortable compared to most backpacks, but it just can't be compared to Farpoint Series and in our case, Farpoint 40. Because the design intention of Farpoint 40 is a backpack, not a suitcase with straps, and hence the impeccable comfort. ​Farpoint 40 provides different sizes (S/M and M/L) AND female counterpart of the pack (Osprey Fairview 40 | from $133.09) while size options or gender specific design aren't available in Porter 30. You might wanna see this! See our in-depth Osprey Porter 46 vs Farpoint 40 comparison! The advantage of Porter 30, on the other hand, is superior organization. Traveler organizer inside the front panel make most of your frequently used items easily accessible. Also a Daylite can be attached to Porter 30 as you can see in the manual, while it can't to Farpoint 40. Our personal choice, if it's not obvious by now, is undoubtedly Farpoint 40 | from $125.00. Just like Farpoint 40, REI Trail 40 is also very comfortable. It too provides 2 size options and women's specific counterparts for seamless fit. Trail 40 has hip belt pockets which would be great to have in Farpoint 40 especially in the airport. They're large enough to fit your smartphone, passport and wallet together. It's also equipped with (1) sleeping pad straps at the bottom, (2) a hydration reservoir, (3) multiple accesses to the pack, (4) internal upside down tent pole sleeves and (5) an attached raincover at the bottom pouch (yes, it's included in the sale). You see, these are GREAT features to have along the trail. However, you wouldn't use most of them while traveling. Also at 21.625 x 13.125 x 10.5 in, for most airlines it's too large to be technically carry-on size. Another downside is that unlike Farpoint 40, the laptop sleeve doesn't have it's own compartment but it's placed in the main compartment so it doesn't feel as stable/secure, and it can only fit laptops up to 15". Farpoint 40 can fit laptops up to 17" and it provides an additional tablet sleeve. Also the fact that Trail 40 is highly flexible and very lightweight, main compartment is easily bent in a "banana shape" - making it harder to pack rigid items such as laptop. Like we said, they're different packs designed for different purposes. The question is, are you looking for a travel backpack or a hiking backpack? The answer is the way to go for you. We hope this review was helpful for finding whether Osprey's Farpoint 40 is for your needs. Please comment below to provide feedback or ask questions and we're happy to respond.